Hey! This is Pankace04 with my first article ever! Today I bring you the gift of darkness, with a beginner’s guide to Mortis in both showdown modes. I think I play Mortis differently than most other players, so if you favor exciting gameplay over getting lots of trophies, stop reading. So, what makes him good? So, Mortis: Mortis doesn’t look good on the surface! He has decent health and great speed, but other than that? Lowest range in the game. Lowest DPS in the game. And yet, somehow, he’s one of the best brawlers in the entire game right now. Mortis excels at one thing, and basically that one thing only: Surviving. I will start with Solo Showdown, which is probably what you’re here for, and go to Duos as well. If you’ve spent any amount of time with Mortis, you shouldn’t be reading this. As I stated earlier and in the title, this is a Beginner’s Mortis guide. If you’ve had Mortis for a long time and want to become a pro, check out this video at the end of this article! If you truly are a beginner, then for your trophy range the usual strategy is to shred boxes, bush camp, and auto-aim your way to victory. Not bad if you’re Primo, Bull, Shelly, and a few other brawlers. Not so with Mortis. Rule 1 with Mortis in any game mode: Never Use Auto-Aim! I can’t stress this enough. Unless you’re attacking a box, Mortis will almost always auto into a wall or away from a player. It is absolutely useless and should not be done. Mortis is a good brawler to use to wean yourself off the auto aim button for higher trophies. He has the shortest range in the game so he’s easy to aim with. A lot of people who just got Mortis take him into Showdown expecting to play the box game. Not so. Many people know that the Survival strategy is great for pushing any brawler early on, but you should at least play Mortis this way half the game all the way up to 500 trophies. Mortis excels at survival because he can dodge almost anything. Ducking and weaving can generally get Mortis to safety with minimal damage. Practice right-left-right dodges excessively. Also, your strategy should not be getting boxes. Once you’ve got three power ups, focus on kill stealing and hiding. It’s not exciting but it works 100%. Mortis usually won’t get first. You need to be ok with that as a Mortis main. However, if you killsteal enough, he sometimes can. Know your matchups and appraise the situation. Is the other contestant a Dynamike? Shred him. Is it a 10 power up Shelly? Walk into the poison and give up. Mortis has favorable matchups against throwers and snipers but he does very poorly against tanks and shotgunners. You will always get trophies if you get 5th or better, so survival is essentially the game plan in solo. Next is duo. I play Mortis very differently in Duo than I do in solo. I use Mortis as almost more of a control brawler than an assassin. I have had tremendous success with one of my friends, a Pam main, by using Mortis to push opponents into Pam’s fire. I use him as an aggro/control brawler in duo, allowing my heavy-hitting partner to do the damage and break the boxes. I chip the opponent and force him into Pam’s fire, resulting in easy kills. Granted, I may die if I try to get a whole team, but Pam can generally take two 1/4 health brawlers on her own easily without a Mortis’s help. Same goes for a lot of other high-burst brawlers, such as Colt, Rico, Leon, and even shotgunners. Now, for the final portion of this guide, I want to give a rough outline of brawler matchups with Mortis. For the most part, Mortis treats each brawler group the same. Shotgunners, such as Shelly, Bull, and Darryl, are Mortis’s worst nightmare. Obviously, Mortis needs to be close to attack, which is what a SG brawler wants. Try to let snipers and sharpshooters take SG’s out. If you or your team reaches Showdown with SG’s, don’t give up, but you need to be content with second. Snipers, such as Piper, Brock, Spike, and Gene, are interesting. They try to stay far away, but think about this. They shoot one projectile. They have low health. You’re MORTIS. You can DODGE. It’s what you DO. Get out of the way. Let them exhaust their ammo. Get close to a Sniper, and you’ve got them in the bag. Dynamike and Barley’s unload takes forever, and with your dash you can escape whatever they send your way. Dash in and massacre them. Against other assassins, you are in trouble. Darryl, Mortis, and Leon fall into this category. You can possibly outplay another Mortis, but Leon and Darryl are basically shotgun brawlers. I’d try to run. In final two, if you can dash based on Leon and Darryl’s shot patterns, you have a chance. Like snipers but with several weaker projectiles, they should be slightly harder than snipers but still easy. Rico is a bit harder to predict with his bounce shots, but you should be able to get through this group just fine. You want to try aggroing tanks and get heavy hitters to finish them off. Bull and Primo are hard matchups for Mortis. Frank, on the other hand… Watch where Frank aims and dash through him to the other side. Play well, and Frank is toast. Support brawlers are tricky, because they are widespread. For example, Poco is EASY. Nita should be as well. But Pam and Bo are much harder to win against. Pam, Bo, and similar Brawlers should be treated like Leon and Darryl because they have specific shot patterns that are some what easy to dodge. 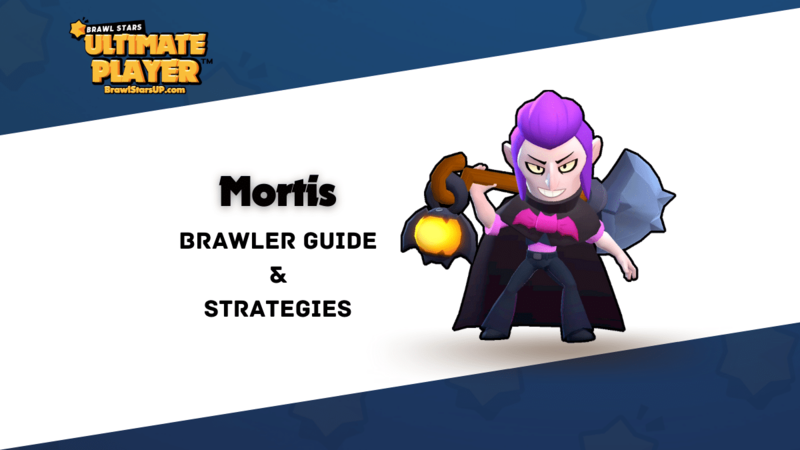 I hope this guide has helped you learn a little more about the coolest brawler in the game, Mortis! If you need help with him, feel free to comment down below or friend me on Brawl @Pankace04.